"I like this, its like a war theme park." MPAA Rating: R for for violence, pervasive language, a scene of strong sexuality and some drug use. I once had a baseball coach who always told me that I could be a "good player when I wanted to be." I, being the sarcastic high school idiot that I was, always replied "Why wouldn't I want to be a good ball player?" After watching Tigerland I can now wholly understand what my coach meant. Director Joel Schumacher can be a good director when he wants to be. After directing good films such as Falling Down and The Client, Schumacher fell into mediocrity with the dismal Batman sequels and 8mm. Yet it is with Tigerland that he returns to the level of quality he once consistently worked at. Tigerland focuses on a company of recruits as they go through basic training, and then on to advanced infantry training nicknamed Tigerland, a grueling preparation for service in Vietnam. Roland Bozz (Farrell) is a draftee who wants out, while his friend Paxton (Davis), a writer has chosen to enlist. Throughout the course of the film, Bozz becomes something of a hero to the men in his platoon as he finds ways out for men who simply don't belong fighting. Bozz is met with opposition from not only his commanding officers but from a fellow platoon member named Wilson as well, who would assume that Bozz doesn't live to make it to the war. Tigerland fails to show the viewer something they have never seen before, but with Schumacher's edgy direction and some very good acting work, the film succeeds. The horrors of boot camp have been shown in numerous films before, army sergeants barking obscenities, recruits sloshing through the muck, tempers rising and humanity fading. Perhaps the most unique aspect of Tigerland is the admission that the military knew going in to Vietnam that it was a losing effort. More than being taught how to maneuver and fight in the jungle, the recruits at Tigerland are shown more how to survive than they are how to fight. It is this intriguing point of view that makes Tigerland one of the better anti-war pictures ever made. Abandoning the flashy style he showed with his two Batman films, director Joel Schumacher relies on an understated documentary-like approach for Tigerland. In a way Tigerland seems a crude, documentary style version of Stanley Kubrick's Full Metal Jacket. Each film is essentially about the necessarily dehumanizing process of turning boys into killing machines, although the comparisons stop there. Shot using a handheld 16mm camera with only available light creates moments when one feels as though watching a documentary about the Vietnam War on the History Channel. But perhaps more so than Schumacher, the real standout in the crew is director of photography, Matthew Libatique. With his work on Tigerland, as well as the brilliant Requiem for a Dream, I am looking forward to his next film. I remember sitting in an airport last October when I saw a magazine with actor Colin Farrell on the cover. Not thinking much of it at the time I immediately dismissed him as some new Dawsons's Creek or Buffy star. Later on that same trip I saw Tigerland making me certain that I will never think of Farrell the same way again. It isn't often that I am so blown away by a performance that I find myself wanting to see every movie an actor has done, but I am at that point with Colin Farrell. As Roland Bozz he brings to the screen a sort of cross between a young Marlon Brando mixed with James Dean. This is one of the best performances of 2000, and Farrell was robbed of an Oscar® nomination. No one having seen this film can honestly say that Russell Crowe gave a better performance than Farrell. Not since Edward Norton in Primal Fear has there been as good a debut performance. Image Transfer Review: As I sat down to watch Tigerland I kept thinking how difficult the image transfer would be to review. Presented in its original 1.85:1 aspect ratio with anamorphic enhancement the film has a very grainy look to it. Many scenes are intentionally shot out of focus and pixelation and edge enhancement is often a problem in the darker scenes. Whether or not this look is intentional is almost a certain yes, but it is hard to determine what is intentional and what is not. I can say that this transfer does look better than the theatrical print I saw did. 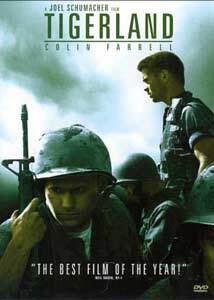 Audio Transfer Review: Those of you with memories of the splendid audio mixes on Three Kings, Saving Private Ryan, and The Thin Red Line will be disappointed to hear that Tigerland features an uneventful Dolby Digital 5.1 mix. For the most part the mix is essentially mono with nearly all of the sound coming out of the center channel. The musical score by Nathan Larson at times becomes prominent in the left and right channels, yet aside from those moments the speakers remain quiet. An English Dolby 2.0 surround track is also available. Extras Review: While not as packed to the brim as other Fox releases have been, Tigerland boasts a few very nice supplements. The most interesting is a feature length commentary track by Joel Schumacher. Much like his commentary for 8mm this is an entertaining listen as Schumacher talks about the low budget and quick shooting schedule. For the most part it sides on heavy admiration for the screenwriter, cinematographer, and cast. But hey they deserve it. Other extra features of note are four screen tests for Colin Farrell. Running a total of nearly ten minutes in length the tests are interesting to watch though not more than once. A short Featurette on the making of Tigerland, two television spots, and theatrical trailers for Tigerland and Tora Tora Tora. Tigerland is one of the undiscovered gems of 2000, and is worthy of a purchase. For those who are a bit skeptical at the mention of the name Joel Schumacher don't be, he does a very good job here. No really, he does. Recommended.